After Food Poisoning Scare at Chicken & Rice Guys, Do You Know Your Rights When Dining Out? Improper food preparation is one source of food poisoning. Chicken & Rice Guys shutdown restaurants and food trucks in Boston and Medford earlier this month for more than a week, after 14 people became ill with E. coli. Ten people had to be hospitalized. Given the widespread food poisoning outbreak, it is likely that there will be liability claims against Chicken & Rice Guys for the poisonings. The Chipotle Mexican Grill in Cleveland Circle in Brighton remains closed after a norovirus outbreak, which has reportedly sickened more than 120 Boston College students. Most of us eat at restaurants and trust they are safe. 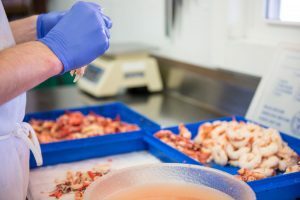 But there are hidden risks for food-borne illnesses and food poisoning, such as unsafe handling of food, not keeping the premises clean, and allowing sick employees to work. While some illnesses pass in a day or two, others are more serious and results in visits to the ER, hospitalization and even death. If you suspect food poisoning, it is important to visit a doctor and depending on the length and severity of your symptoms, consult an attorney about your legal rights. 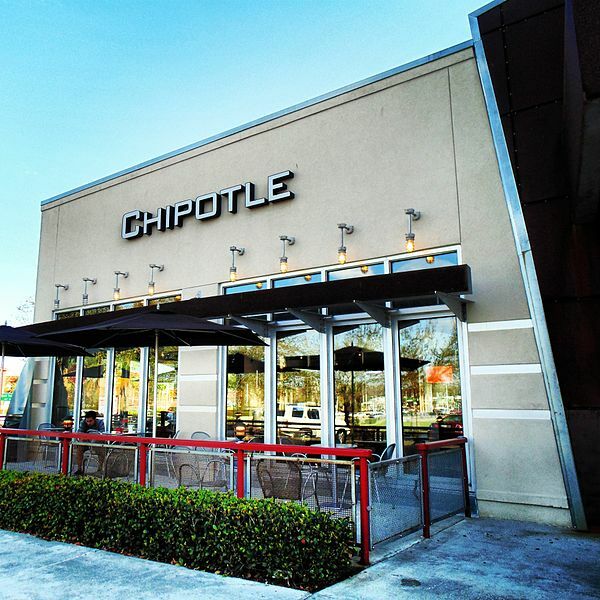 Chipotle restaurants in the northwest and Maryland have recently been linked to 52 cases of E. Coli food poisoning. But the City of Boston’s initial testing showed the presence of norovirus at the Chipotle in Brighton. The Brighton restaurant closed Monday after Boston College reported 30 students, including members of the men’s basketball team, became sick after eating there. A college spokesman has since raised the number to more than 120 students. City inspectors have cited Chipotle with three violations, including allowing a sick employee to work a few days prior to the outbreak and cooking chicken and steak below the required temperature of 140 degrees. Norovirus causes acute gastroenteritis, the inflammation of the stomach or intestines or both. Symptoms include stomach pain and cramping, diarrhea, vomiting and headaches. E. Coli can have similar symptoms, but norovirus is a viral infection and cannot be treated with antibiotics. Doctors often encourage those who are infected to drink plenty of fluids as they recover to prevent dehydration. Norovirus is not typically fatal. Boston College has tested its students for both E. Coli and norovirus, but test results have not been released publicly. Food poisoning is more common than many realize. Each year, 48 million (or 1 in 6) Americans suffer some form of food poisoning, according to the Centers for Disease Control and Prevention (CDC). While some cases make the news, many do not, even though 128,000 people are hospitalized and 3,000 die each year from foodborne illness. Each year, 19 to 21 million people in the U.S. suffer norovirus, according to the CDC. Doctors treat nearly 2 million people as outpatients and another 400,000 people have to seek care from hospital emergency rooms. How Long Will Norovirus Symptoms Last? Symptoms often appear after one or two days and individuals may be sick for two to four days. Where is Norovirus a Risk? You can contract norovirus by contact with an infected person, touching infected surfaces or when an infected person handles food. It is airborne and can stick to surfaces. Because of this, norovirus can spread quickly in places where large numbers of people gather and pass through, such as restaurants, schools and daycare centers. Last spring, more than 200 people contracted norovirus on two Royal Caribbean cruise ships. Can I Sue for Food Poisoning and Norovirus? As with any injury caused by someone else’s negligence, you may be able to file a lawsuit if you suffered food poisoning. But you should consult an experienced personal injury attorney to advise you on the law and your specific circumstances. A Northeastern grocery store chain has recalled various packages of ground beef after 14 people have been infected with an antibiotic-resistant strain of Salmonella. Hannaford, of Scarborough, Maine, issued the voluntary recall Thursday, Dec. 15, for an undetermined amount of fresh ground beef that may be contaminated with Salmonella Typhimurium. This strain of Salmonella is resistant to treatment by many antibiotics, including drug classes such as beta-lactams and aminoglycosides. Seven of the 14 people who suffered food poisoning were hospitalized. The United States Department of Agriculture (USDA) has classified the recall Class 1 with a high health risk. This classification means there is a reasonable probability that use of a product will cause serious, adverse health consequences or death. The grocer recalled 10 different types of ground beef, ranging from 73 percent to 90 percent. Hannaford said most of the affected individuals had consumed 85 percent. The affected packages have the sell-by date of Dec. 17, 2011 or earlier. They were sold at Hannaford stores in Massachusetts, Maine, New Hampshire, New York and Vermont. Hannaford is offering consumers a full refund. The ground beef involved in the food poisoning outbreak was sold under the brand names of Hannaford, Taste of Inspirations and Nature’s Place. The USDA is reminding consumers to check their freezers as well as refrigerators as it continues to investigate. The USDA said Hannaford kept limited records regarding the source of the ground beef and it is unable to determine the responsible supplier. The government agency said it will pursue rulemaking to address this problem in the future. Salmonella is one of the most common bacterial foodborne illnesses. It can be life-threatening in individuals with weak immune systems, such as the elderly. Common symptoms include diarrhea, abdominal cramps, fever, headache, chills, nausea and vomiting. The food poisoning symptoms can start within 12 to 72 hours of food consumption and last up to seven days. The USDA advises consumers to take special care in handling ground beef to avoid Salmonella. Wash Your Hands. Consumers are urged to wash their hands with warm, soapy water for at least 20 seconds before and after handling food. Separate. Keep raw meat, fish and poultry away from other foods that will not be cooked. Use separate cutting boards for different meats and egg products. Cook Properly. Cook meat to safe internal temperatures. The safe internal temperature for beef and pork is 160 degrees Fahrenheit and 165 degrees for poultry. Use a food thermometer to check. Refrigerate Immediately. Refrigerate raw meat and poultry within two hours of purchase or one hour if kept in temperatures of 90 degrees or greater. 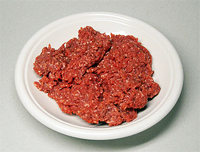 Click here to read the full USDA notice on the Hannaford Ground Beef Recall.